I find that there are times when designs just fly off my hook, while the other times I cannot even bring myself to pick up that hook. Fortunately I have been living in the world of the former and not the latter as of late. As a result I have a new free pattern available for you! Stacked Ladders Cowl grew out of my playing with a skein of Anzula Croquet yarn. The yarn is light weight and a 50/50 blend of Superwash Merino and Tussah Silk. 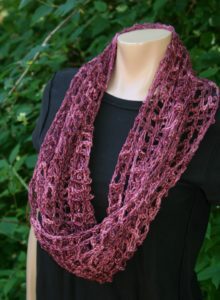 It honestly is a luxurious yarn to work with, it is so soft and even what I would call billowy or lofty, while still being quite structurally strong. This Cowl takes only 1 skein, and is a quick project, so it is perfect to check out a “new to you” yarn while creating a gift for yourself or someone special. 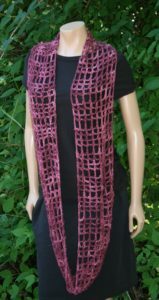 It is a light, airy design that is a great transition piece for fall or spring. If you are not a cowl fan, it is simple enough to just work it as a scarf. This design is worked up with a large hook, but if you do not have anything quite this large, use the largest hook you feel comfortable with, you will be happy with the results. Row 1: Sc in 2nd ch from hook, sk 3 chs, (ch 3, sc in next ch) 8 times, turn. Rows 2 and 3: Ch 1, sc in same st, (ch 3, sc in next sc) 8 times, turn. Row 4: Ch 6, dc in next sc, (ch 3, dc in next sc) 7 times, turn. Row 5: Ch 1, sc in same st, (ch 3, sc in next dc) 7 times, ch 3, sk 3 chs, sc in next ch, turn. Rows 6 and 7: Rep Rows 2 and 3. Rows 9-100: Rep rows 5-8. Fasten off. Seam Row 1 to Row 100 while weaving in ends. 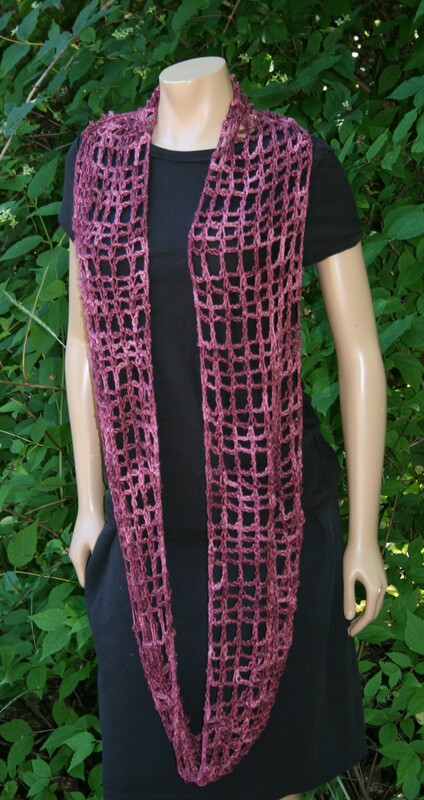 This entry was posted in Patterns/Design Thoughts, website and tagged cowl, Crochet, dean, Design, Free pattern, hook, hooks, ideas, inspiration, linda, Linda Dean, linda dean crochet, pattern, Ravelry, stacked ladders cowl, stitch, Stitches, wool, Yarn by webmaster. Bookmark the permalink.